The first dish I ever “cooked” by myself was a peanut butter sandwich. I was three years old at the time. My mom had gone to visit an elderly neighbor and my dad was busy reading something for work. He promised to make me dinner soon, but “soon” wasn’t soon enough, so I decided to take matters into my own hands. Using the kitchen cabinet drawer handles as a ladder, I climbed up onto the counter and pulled out my special plastic purple plate. Then I grabbed the bread from the bread basket and the jar of crunchy peanut butter and made myself a sandwich. 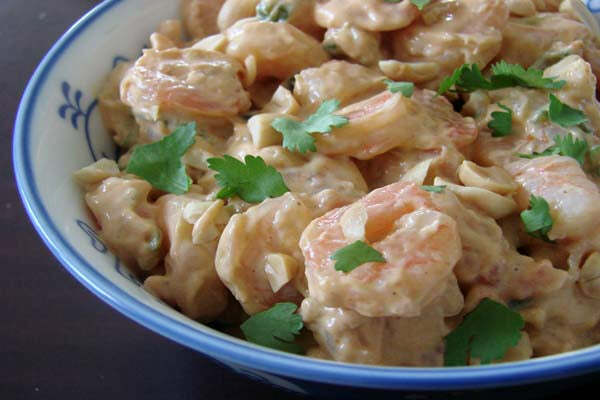 In the years since, I’ve made countless peanut butter sandwiches and while a plain peanut butter sandwich or a classic PBJ never fails to satisfy, sometimes I like to mix it up, like with this spicy peanutty chilled shrimp salad. Served on a warm, crusty baguette it makes for tasty summer lunch. 1. In a medium skillet sauté garlic in vegetable and sesame oil. 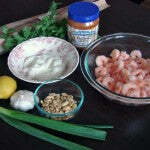 When garlic begins to brown, add shrimp and toss. Sauté for two minutes. Remove from heat, strain any excess liquid and reserve. 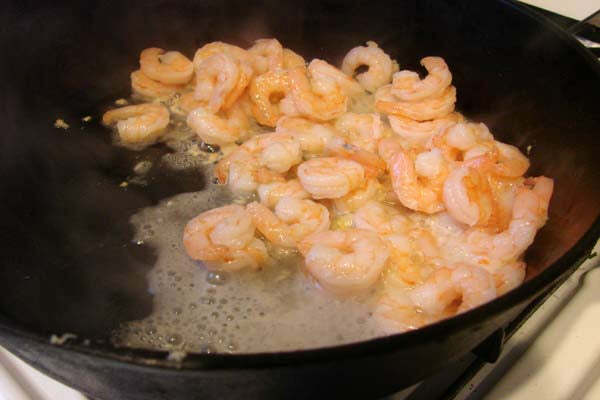 Place shrimp in a medium bowl.Return liquid to stove and reduce until one tablespoon of garlic and liquid remains. 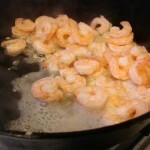 Add liquid and garlic mixture to shrimp, mix well and chill for at least an hour. 2. 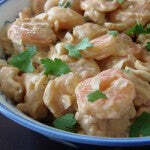 In a large bowl whisk together The Heat Is On peanut butter, sour cream, lemon juice, and fish sauce. Finely chop one scallion and add to peanut butter mixture. 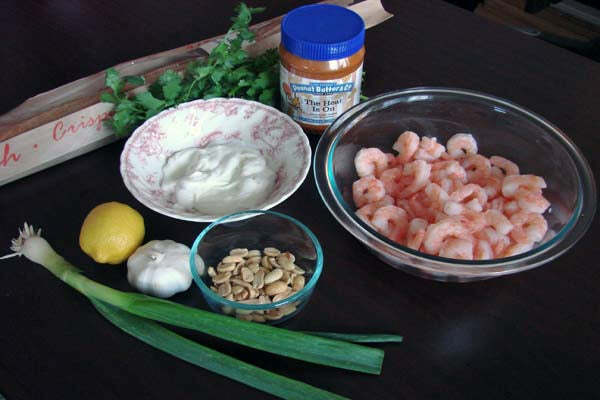 Add chilled shrimp, peanuts, and chopped cilantro and toss. 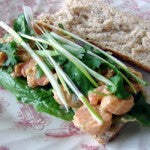 Return shrimp salad to refrigerator until ready to assemble sandwiches. 4. 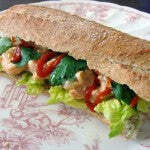 Top each mini baguette with one leaf of lettuce and divide the shrimp filling between the four sandwiches. Julienne the remaining scallion and distribute among the sandwiches. 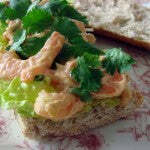 Drizzle sandwiches with lime juice and top with cilantro and Sriracha sauce to taste. Serve immediately. If you are making fewer than 4 sandwiches, the shrimp salad can be stored in the refrigerator in an airtight container for up to a day. 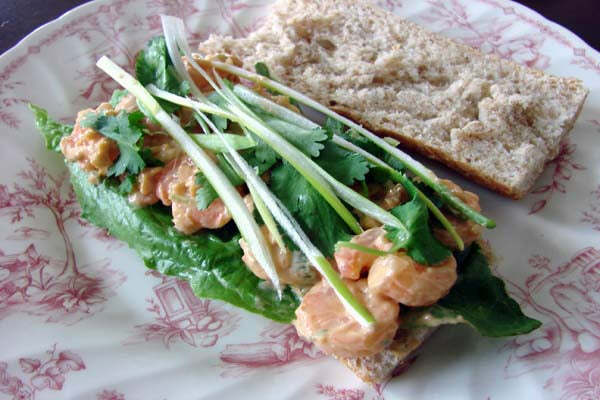 The post Spicy Thai Peanut Shrimp Salad Sandwich appeared first on - Peanut Butter & Co. Recipe Blog.